Nothing is more terrifying than the dark, not the darkness itself, per se, but what might lurk within it. Not being able to see something that may be out to get you is a frightening situation to be in. Many predators in the natural world hunt exclusively at night because it gives them a clear advantage. 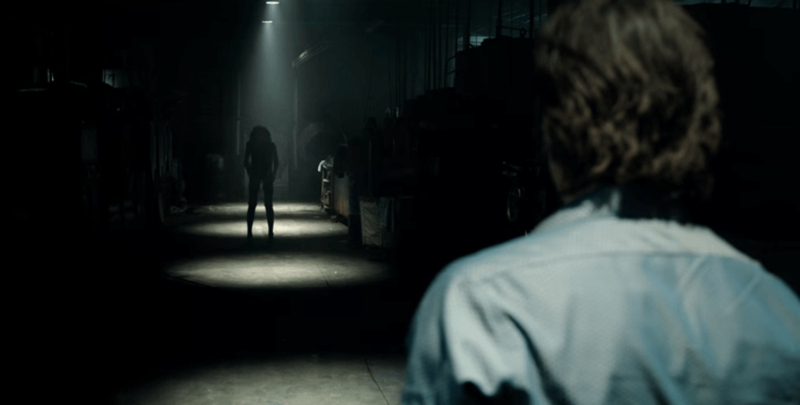 A creature in the unnatural world that goes after its victims under the cover of darkness is the premise of the newest supernatural horror film, Lights Out. Teresa Palmer plays Rebecca, a young woman living on her own, whose mom, Sophie (Maria Bello) is suffering from a mental illness where she sees an imaginary friend. When this ‘friend’ begins to threaten Rebecca’s half-brother, Martin, she is forced to step in and confront this evil presence as well as the issues that have split her family apart. What makes this entity all the more disturbing is that it can only be seen when it resides in the shadows. When light is available, it disappears. Can Rebecca fight off this sinister specter and save her family? Lights Out is the latest in what has proven to be a very successful summer for horror this year (The Shallows, The Conjuring 2, The Purge: Election Year). Horror films often use varying degrees of blackness as the setting for much of the action, but Lights Out takes the darkness and utilizes it as its central premise, and does so quite effectively. When the lights dim and you think you see something, but you’re not sure, is something we can all relate to, and Lights Out readily taps into that fear of the unknown. The film also very creatively comes up with various sources of light in which to fend off the malevolent spirit. While light, and the absence of it, are naturally, the main devices used in the film, the surround sound effects also contribute a great deal in creating the intense levels of anxiety and suspense. The relatively small cast is terrific throughout. Palmer (I Am Number Four, Warm Bodies) is a very appealing lead, and while we know little about her other than the Avenged Sevenfold and Slayer posters on her walls, we come to learn of the effect her mother’s illness has put on her. This has forced her to keep her emotions at bay when it comes to her ever-understanding boyfriend, Bret (an excellent Alexander DiPersia). Their relationship is conveyed very naturally and with humor too, and is much better written than one might expect from a supernatural horror. Gabriel Bateman (Annabelle) is wonderfully cast as Rebecca’s little brother. He invokes tremendous sympathy when he tells his sis he just wants to get a good night’s sleep. He also has some of the movie’s best lines, as when he reminds his mother to take her vitamins, aka, meds. Finally, Maria Bello is very believable as a woman off her rocker, but due to reasons beyond her control. This dysfunctional family is the heart and soul of the film and one can only hope they can get another chance at life. This marks an auspicious debut for filmmaker David F. Sandberg, who based Lights Out on his short film from three years earlier. He’s one to watch out for, and is already set to direct Annabelle 2. Writer Eric Heisserer, whose previous credits include The Thing prequel and Final Destination 5, co-produced along with Lawrence Grey and James Wan. Wan, of course, is the man behind the Saw, Conjuring and Insidious franchises, and his name attached to a horror film generally means audiences are in for a ride. Speaking of rides, he has graduated to big-budget summer spectaculars too, with last year’s Furious 7, and, next up, DC’s Aquaman. 2106 has been an excellent year for horror, and Lights Out continues that trend. It’s an expertly made film with a standout cast and plenty of jump-out-of-your-seat scares. So, head to the nearest darkened theater, and if anyone near you turns their annoying cell phone on, just yell at them, Lights Out!